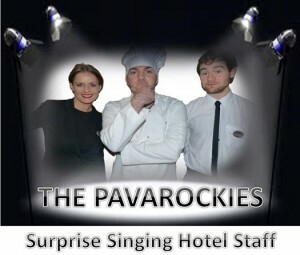 The Pavorockies Singing Waiters performing live songs from the musicals plus classic pop & rock. This is a group that can engage an audience from start to finish and have been a huge success at weddings, charity balls, gala dinners and for corporate clients. The Pavarockies have the ability to perform to the highest level but also interact with their audience so that everyone has a lot of fun including the Pavarockies!! The show begins when the manager makes an announcement that the entertainment will be delayed. The” waiter” offers to fill the gap by singing. With a look of surprise on people’s faces he suddenly bursts into song and stuns the audience with a well known song from the musicals. Immediately there is a commotion from the Kitchen. The Chef bursts into the room outraged and demanding to sing because he is a far better singer than any waiter! He is brilliant and wows the audience with a couple of rock classics. The manager has had enough and emerges from her disguise to sing a rock duet with the chef before being joined on stage by the waiter. The show ends with the whole audience singing along for a great finale. The show can be tailored to suit your special event, wedding or party.